"I keep having these memories… I see flashes, I think I had a life here. But I can't tell if it's real." Marvel Studios + Disney have unveiled the first official trailer for the highly anticipated Captain Marvel movie, starring Brie Larson as the iconic Marvel superhero. Larson plays Carol Danvers, an Air Force fighter pilot who becomes one of the universe's most powerful heroes when Earth is caught in the middle of a galactic war between two alien races. Set in the 1990s, Captain Marvel is an all-new adventure from a previously unseen period in the history of the Marvel Cinematic Universe (which includes Blockbuster!). The film stars Gemma Chan, Jude Law, Ben Mendelsohn, Lee Pace, Djimon Hounsou, Annette Bening, Colin Ford, Lashana Lynch, and Samuel L. Jackson as Nick Fury. This is a good ole fashioned teaser, with some epic footage along with a re-introduction of Fury. So far so good!! I really enjoyed this teaser, bring it. 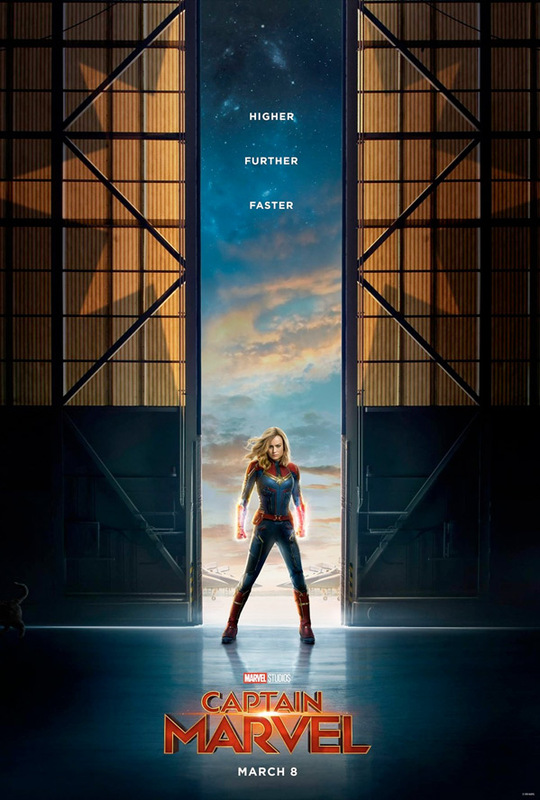 Set in the mid-1990s, Captain Marvel follows Carol Danvers (Brie Larson), a former U.S. Air Force fighter pilot, as she turns into one of the galaxy's mightiest heroes and joins Starforce, an elite Kree military team, before returning home with new questions about her past and identity when the Earth is caught in the center of an intergalactic conflict between two alien worlds. Captain Marvel is directed by American filmmakers Anna Boden & Ryan Fleck, both directors of the films Half Nelson, Sugar, It's Kind of a Funny Story, and Mississippi Grind previously. The screenplay is co-written by Meg LeFauve, Anna Boden & Ryan Fleck, Nicole Perlman, Geneva Robertson-Dworet, Liz Flahive, and Carly Mensch; based on the Marvel character created by Roy Thomas & Gene Colan. Disney-Marvel will release Boden & Fleck's Captain Marvel in theaters everywhere starting March 8th, 2019 early next year. First impression? Who's down?